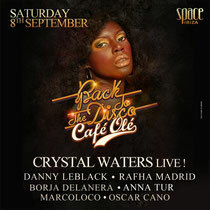 Café Olé at Space Ibiza gets glamorous with Back to the Disco tonight with a live performance from Crystal Waters. Crystal takes to the stage alongside Danny LeBlack, Rafha Madrid, Oscar Cano and Marco Loco. Before her success, Crystal Waters worked behind the scenes in the world of music, writing song lyrics for artists, where her life took an unexpected turn when she wrote ‘Gypsy Woman’ for fellow artist Ultra Naté. Crystal recorded a demo that the producers she was working with at the time liked so much, they immediately signed a recording contract with her - and the song never reached the hands of Ultra Naté. This was followed by three albums, numerous hits and a career that has spanned almost 20 years. With her latest collaboration with Yolanda Be Cool - Le Bump – you can instantly hear the unmistakable vocals that have made her synonymous with some classic tracks. Support on the night comes from Rafha Madrid, one of the young talents of Spanish house, this star pupil of the Chus & Ceballos Stereo Productions school has been remixing their classic tribal sound that helped make the duo famous around the world. When the season finishes, he will begin a tour of South America where his latest productions, ‘Tumba La Casa’ (Stereo most popular tracks. Tonight could be a biggie!